Anyone But Ivy Pocket by Caleb Krisp... Laugh Yourself Silly! Ivy Pocket is a twelve year old maid of no importance, with a very lofty opinion of herself. Dumped in Paris by the Countess Carbunkle, who would rather run away to South America than continue in Ivy's companionship, our young heroine, of sorts, finds herself with no money and no home to go to...Until she is summoned to the bedside of the dying Duchess of Trinity. For the princely sum of £500, enough to buy a carriage, and possibly a monkey, Ivy agrees to courier the Duchess's most precious possession, the Clock Diamond, to England, and to put it around the neck of the revolting Matilda Butterfield on her twelfth birthday. It's not long before Ivy finds herself at the heart of a conspiracy involving mischief, mayhem and murder. Twelve year old Ivy Pocket is a young lady of worldly proportions. Plucked from an orphanage where she doesn't remember her parents, but is certain they were utterly fabulous and adored her nonetheless. After working as a maid for a horrendous Countess in Paris, who clearly doesn't deserve her expertise, Ivy finds herself homeless, penniless and over qualified for a dreary maid position. So when Ivy is summoned by the dying Duchess of Trinity for an errand, she's promised enough money for a new life and to return to England. On one condition. She must deliver a priceless heirloom in The Clock Diamond, a necklace that is to be presented to a one Miss Matilda Butterfield, a horrible an entitled girl and the granddaughter of The Duchesses estranged friend. The Clock Diamond isn't what it seems and Ivy will find herself at the center of a vicious hunt to obtain the Diamond, at any cost. But behind the confidence and bravado, Ivy is just a girl who feels abandoned, unloved and is seeking the happily ever after she so desperately deserves. Once in a while a book comes along that you utterly fall head over heels in love with. Ivy Pocket, you are incredible. Ivy is a character you're never likely to forget. Only twelve, but she's full of self importance and tall tales about her life. She's brash, arrogant and quite rude... But Ivy sees her meddling and astute observations as a wonderful character trait, often baffled at the overreaction of those she's kind enough to grace her opinions with. But for all of Ivy's flaws, I found her fabulously flamboyant, dramatic and incredibly charming. In her short amount of years, Ivy has had to grow up without parents to guide her, and although she'll boast of her impeccable social skills, Ivy has never had a true friend. Until now. But Ivy is naive and although she'll tell you otherwise, she's easily manipulated and finds herself embroiled in a deceptive scheme to steal the necklace, not leaving the twelve year old knowing who to trust. Ivy's adventure is hilarious, entertaining and wonderfully written. Too often, books intended for middle grade readers tend to force a hidden meaning, educating the reader and forgotten are the core elements of children and middle grade novels, to have fun, to delight, to charm and entertain and author Caleb Krisp has done exactly that, intelligent humour. I absolutely adored Ivy. Her sassy quips, her ability to pay backhanded compliments with so much flare and pizazz had me giggling myself silly. 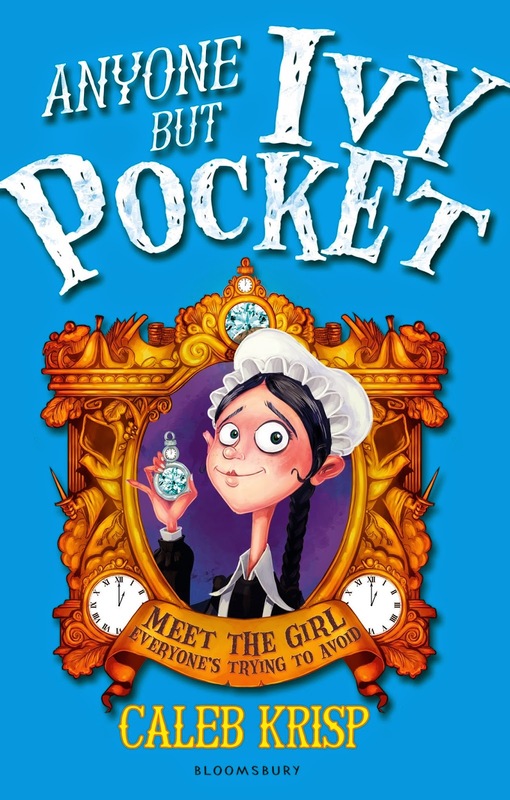 Without a doubt, Anyone But Ivy Pocket is one of the most hilarious, sassy and entertaining middle grade that you'll ever have the pleasure of reading. She was so adorably sassy, even without meaning to be. She's fun, snarky and so incredibly funny. Definitely grab a copy, this is one that both adults and kids will fall in love with. This is so great! You are right, a lot of middle grade books try to teach a lesson and as a teacher that can get quite tedious, especially for my students. I sometimes feel like I'm preaching not teaching, lol. I always look for books the children in my class can read outside of class for fun! I'm tried of recommending the usually harry potter, percy jackson, etc, etc. While they are good books it's always nice to hear something new and intriguing! Seriously, Thanks for this!!! Great Review!! Thanks Taylor. I couldn't agree more. Reading should be fun firstly, with kids able to use their imagination and be entertained. Not every book needs a strong social message. This one is absolutely incredible! It'll be hard to read out loud without sniggering at her antics. It's so much fun! Kids will love Ivy's backhanded compliments, I was killing myself laughing at how brash she is. But in her defense, she really has no idea that her little comments were classed as insults. You'll probably want to keep this one for yourself Lily. I've been here! Here Joy! I know. Been trying to get all my latest reviews written up and feel like I can barely string a sentence together lately. Just so, so tired. It does. My goodness does it ever. But of course smushy isn't rude like that. It's more because they're both little, sweet and chatterboxes. And a little bit inappropriate. I'm kidding. But honestly, they could be twins. We do Claudia, get them out there, review them and promote them and share them with parents. There's nothing more lovely than being able to read with a child and instill that sense of awe and wonder while using their imagination. She'll adore this one, Ivy is super cheeky, but without meaning to be and had me laughing out loud too. I loved Matilda, Charlie and the Chocolate Factory was my favourite though. I love middle grade purely for it's fun and simplicity and Bloomsbury really are the ultimate middle grade publisher. I absolutely adored Ivy, it's hilarious and so incredibly entertaining. She's YOU. I'm sure of it. Have you had any suspicious authors trailing you? Perhaps forcing you to wear a necklace and throwing tiny monks at you? It is and who doesn't need a laugh from time to time, especially from our books. It's by far the funniest middle grade book I've come across, and the bonus being that it's a series too. I adore Ivy and can't wait until everyone else meets her as well. I find that middle grade characters easily worm their way into my heart, so I'm pretty sure I'm going to love Ivy Pocket as well! :) Her sass sounds awesome as well. I'm always up for a good laugh. :) Fantastic review, Kelly! Thanks Aimee. I loved her, she's snarky, insulting and really quite offensive without meaning to be and really has no idea that she is even. Absolutely hilarious. It's so incredibly entertaining Lauren, I adored Ivy and already impatient for book two. Definitely grab a copy, I can't wait to see what you think of it. I still love them Joy. They make such a nice change from young adult and adult novels. Bloomsbury have such an awesome catalogue of middle grade as well, they're the premier publisher for so many incredible titles. I hadn't heard of this book till now but it sounds so much fun and with a deeper meaning as well, so perfect!! Thanks Frannie. It's fantastic, so incredibly funny but underneath it all, Ivy is just a girl who wants a home and family to call her own. If she weren't fictional, I'd adopt her. Ivy definitely sounds like a lot of fun to read, with her outlandish character and her snarky quips. Love the sound of this, glad to hear you enjoyed it Kelly! And the funny thing, she's so much like the little smushie over at Paper Fury, it's uncanny. Little, sassy and full of personality. If I didn't know any better, I'd day that the author had her in mind when he wrote it.